March 8 marks International Women’s Day, a day where people from all over the world celebrate the social, economic, cultural, and political achievements of women. This year’s theme is gender parity, aka gender equality, in terms of education, economic opportunities, political status, health, and other factors. Inspiring girls in STEM has always been an important part of our company’s work—remember, iD Tech was founded by two Silicon Valley women in 1999: mother and daughter duo Kathryn Ingram and Alexa Ingram-Cauchi. Since our inception, we’ve continually made it a point to run awesome camps that are welcoming of both genders. We also created an all-girls technology camp, Alexa Café, where we teach tech with an emphasis on philanthropy, entrepreneurship, and leadership. Due to its success in past seasons, we have expanded Alexa Café to 14 campuses across the country. Why Does Gender Parity Matter? We talk about closing the gender gap in STEM fields pretty frequently, but we still get many questions about why it matters that these fields (and any fields, really) reflect the diversity of our world. What would change if women and minorities were equally represented in all jobs and positions? What would be different? At iD Tech, we believe that we are most innovative and inspired when our workforce is comprised of a diverse mix of genders, races, ideologies, and passions. But don’t just take it from us. We asked some industry leaders about the lack of gender parity in STEM, specifically technology, and how they and their companies are working hard to right these inequalities and work toward a brighter future where both women and men are equally heard and hired. Not only do their responses illuminate why it’s so important to close the gender gap, but they also offer suggestions for how each and every one of us can make a difference starting today. 1. People have offered up a number of reasons why girls aren’t pursuing STEM fields at the same rate as their male counterparts, be it the “leaky pipeline,” harmful stereotypes, institutionalized sexism, or a lack of access to the right curriculum. Where do you see the most opportunity for positive change? "STEM needs to be added to early education so that it's not an opt-in system, but is instead integrated with the other subjects that students are already learning. Our current system makes it so that kids who want to learn about technology, engineering, and computer science must seek it out extracurricularly. Because girls learn that STEM is for boys, they never even get exposed to STEM, which would allow them to figure out if it’s something they’re interested in. "Our ability to build collaborative environments that encourage knowledge-sharing, creative thought processes, and innovative ways of approaching problems, solutions, and the like." 2. What do you perceive to be the short- and long-term benefits we’ll see once more women are participating in STEM fields? “In the short term, the pool of engineers, developers, and scientists will become more diverse, in terms of gender, but also, hopefully, in terms of race, thinking, backgrounds, and teaching. We need diversity in STEM so that the technological products, services, and solutions we’re designing reflect the needs of the world’s population, and not only the needs of a few. It’s also self-perpetuating—more women in STEM fields will lead to more girls pursuing STEM, as they see strong female role models in these fields." “As more women enter STEM careers, more girls will see STEM as an area where they belong. It’s clear that we haven’t reached the full potential of technology with only half of our population having full access to these fields. In medicine, you'll see a greater emphasis on women's health, whereas medical research is currently currently skewed toward men's issues. In computer science, different types of tech companies will be created and more jobs will be filled because women will be able to occupy roles in the expanding tech sector. "In the long term, our children can stop fretting about the perceived glass ceiling because there won't be one. Instead, they can start solving the big issues that face this generation with an equal and valued seat at each and every table." “A key short- and long-term benefit of increasing the number of women in STEM fields is the addition of new voices, perspectives, and ideas." “Beyond encouraging more women to participate in these fields to help expand the candidate pool, STEM fields will also benefit from the skills that women often bring to the workplace. In addition to technical or “hard” skills, women often excel in “soft” skills such as creativity, critical thinking, problem solving, and communication. Whether providing feedback or negotiating a project, good communicators are more prone to be seen as team players and set boundaries in productive ways. Increasing the number of women in STEM fields would expand the number of available workers, educators, and innovators while bringing a new dimension to the workplace." 3. How is your company working to involve more girls in STEM, both now and in the future? “Engaging girls in technology has always been a priority for iD Tech. Although we make a deliberate effort to create camps that are welcoming for both boys and girls, Alexa Café lets us reach girls in a unique way. “We at Tynker make sure our products have universal appeal to girls as well as boys. We focus on having a lot of gender neutral characters—like dragons and cute trolls—and we make sure to get feedback from both girls and boys to see whether they enjoy our products. "We at iD Tech are breaking the mold that helped perpetuate this lack of interest in STEM-related topics by providing new and innovative way for girls to learn, explore, and master STEM in a non-competitive environment: Alexa Cafe. Change is slow, but we're committed to making a difference one child—one girl—at a time." “littleBits is a gender-neutral platform that is designed to unleash creativity and instill a love of STEAM through the cycle of inventing. We get girls to fall in love with STEM by showing them how it fits in with hobbies they are already in love with, whether robotics or arts and crafts or fashion or social activities. We try to show inventions and lessons in all sorts of contexts so that we can meet girls where they are, and we introduce new concepts via hands-on, project-based challenges. As a result we see girls thinking about the applications of STEM by solving real-world problems with littleBits." “With an emphasis on access and exposure to next-generation design and engineering tools, Autodesk is committed to encouraging younger generations to enter STEM disciplines. Platforms like Design Academy highlight female engineers, makers, and educators through blog posts and videos, showcasing tangible examples of potential career paths in STEM fields. Additionally, all Autodesk employees are encouraged to participate in mentorship programs with students and peers to offer perspective on STEM careers, including visiting elementary school classrooms or keynoting at women in tech events. 4. Tell us one or two things that any person can do to help girls get involved and interested in STEM. “Getting girls excited and involved in STEM starts when they're young. 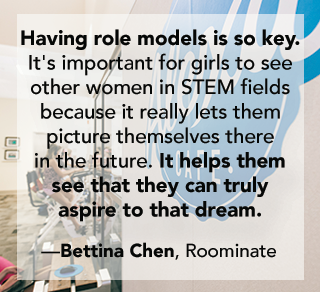 With Roominate, we're trying to reach girls as early as possible and expose them to the fun and creativity in STEM through play. It's important to expose girls to all kinds of subjects at an early age to show them that their future is limitless and it's really up to them in what they want to aspire to do. It's equally important to continue reaching them throughout their educational career. The gender gap isn't going to change overnight, so it's crucial to encourage the current generation to not be afraid to pursue what they love, whether it be STEM or a different career. They're going to face a lot of obstacles along the way, so having that support and encouragement goes a long way." “Encourage young women in your family and community to pursue their curiosities and interests. 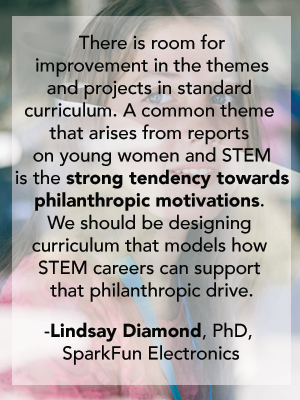 A strong support framework is key to improving opportunities for young women to get involved in STEM. Women in STEM should consider being more present in their communities by volunteering at libraries, makerspaces, schools, and other community gatherings." “At a minimum, we can share stories of women in these fields and fight the tendency to automatically label girls as “not interested” in STEM. We can also promote gender-neutral STEM tools and toys." 5. Who has been a role model in your career? 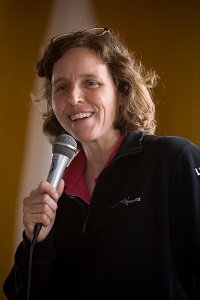 “Megan Smith, the first female U.S. Chief Technology Officer, because she is working to bring the latest in technology to government and schools and also working hard to get more girls and women into STEM." "The women in my family. They are resilient to a fault, mindful beyond their years and have taught me to find that internalDrive each and every day." 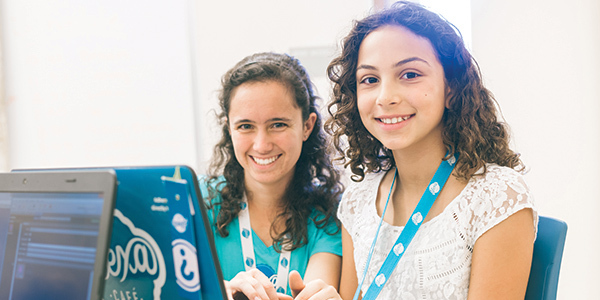 While girls attend and enjoy all of our five summer camp divisions, Alexa Café provides a unique all-girls setting where girls can meet mentors and get excited about the possibilities technology brings. Your daughter can join us at one of 14 campuses around the country to learn about technology through the lens of philanthropy, entrepreneurship, and leadership. 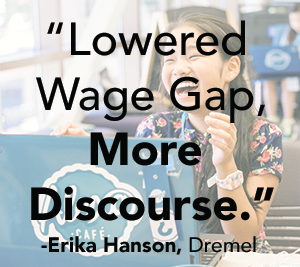 Learn more about Alexa Café or view all of our 150+ prestigious summer camp locations.